Now, for the rest of you, I will avoid any major plot spoilers but I will reveal the aforementioned plot point in the course of discussing it. The “zombies” of this film are living victims of a virus that makes them hyper aggressive, essentially mindless and highly contagious. Sounds familiar enough so far right? Well, the twist is this virus is not communicated by biting or blood contact. It’s spread by language. Weird enough for you? The victims get sucked into psychotic mental loops where they repeat sounds and phrases endlessly and mindlessly, leading to some very aggressive and typically zombie-like behavior (biting, ripping and other physical assaults). This is slowly revealed over the course of the film and finally realized and discussed by the main characters when a new character is introduced seemingly for the sole purpose of explaining it. He literally climbs through a window, explains what is happening, then exits a window. It’s a little contrived and it’s probably the movie’s biggest weakness, but it essentially works. Absent that deus ex machina, I’d hazard a guess that most audiences would be utterly baffled by the story — well, even more baffled than they probably were anyway. The whole film, apart from a brief scene in a car and two brief exterior scenes, takes place in a radio station in the basement of a church. The confined setting works well within the scope of the story. Much of the action is described by callers to the radio show, describing what they see (especially a traffic reporter). 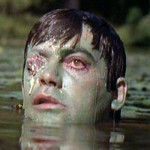 The zombies themselves appear relatively briefly, but are very effective in their screen time. There’s even a nice bit of gore thrown in that works really well and is genuinely gross and surprising. The film has a very eerie, Twilight Zone feeling and it plays a lot of tricks with language. The radio-show format that puts the focus firmly on the sound of the voice is particularly effective, considering the main plot point of a language-transmitted virus. Technically speaking, it’s a very “talky” film and though it does lose focus a bit in the last third it never bogs down or feels too slow. A lot of the film rests on the shoulders of Stephen McHattie, who is brilliant as radio host Grant Mazzy, a Don Imus shock-jock type exiled to the morning show in a shithole town for unspecified reasons. His performance, and particularly his top-notch voice and delivery, are perfect for the role — I honestly can’t imagine anyone else doing it. So is it a zombie movie though? A simple description of it — a language virus that causes aggressive, murderous behavior — would probably lead me to conclude that it is not. But in action, it so clearly looks and feels like a zombie movie, I am swayed the other way. It plays as a brilliant deconstruction of the zombie myth, one that takes the essence of zombiedom, inverts it, adds some completely novel elements and yet ends up recognizably zombie. It’s comparable in its complexity and open-endedness to something like Donnie Darko, and likely will cause just as many severe reactions pro and con as that film did. It’s not perfect by any means, and may leave people confused, disappointed and irritated. But if you’ve got an open mind and want to see a genuinely novel approach to the zombie, I can not recommend it highly enough. Director Bruce McDonald and writer Tony Burgess have crafted something special, the kind of film that comes along once in a lifetime: completely original yet firmly rooted in the genre’s history. Final note: Watch the entire credit sequence at the end. Not only are there some revealing audio clips that play over them, after they are over there’s a scene that adds a whole new bewildering twist to the film.